I have decided that I will no longer buy games unless they were published by Ubisoft or EA exclusively for Windows. There is nothing better than those combos. Except maybe always Online. Who needs offline play anyway? For those who don’t follow me closely, I despise a number of positions, mostly due to DRM, that both EA and Ubisoft take. The Online-only requirement of many of their games being a big part of it. Additionally, as a Linux user, I try to avoid any game, with some exceptions, that do not have a Linux version. Reason is just so wrong on this issue. No Fly Lists are the best things the government has ever done. They keep us safe by keeping crazy people off flights. If anything, the list needs to be bigger. Just think about all the crazy people who would be sitting next to you if we didn’t have these lists. As for finding out why you are on it, you know what you did. If you didn’t do anything wrong, you wouldn’t be on the list. Simple as that. Of course I think any violation of our 6th Amendment rights to be a very bad thing. Any process that allows the government to make decisions and dole out punishment without proper due process is a horrible practice. I would never support something like this and campaign continuously to undue all the damage done after 9/11. I have also decided to give up in my endeavor to see ballot access reform in Oklahoma. I have decided to instead join the Republican party. This means that I will be working with them to make Oklahoma a one party state in which the only options available to voters will be Republicans. If you can’t beat ’em, join ’em. That’s my new motto. I have been an Independent/Libertarian all my life and don’t plan on being anything else. The Republican controlled Oklahoma government has been a source of many frustrations as efforts to open elections have been thwarted at every turn. About the only thing the REpublican party can do regarding ballot access is to make it worse by doubling candidate filing fees this year. I have also been converted to the idea of Keynesian Economics in which government spending drives a healthy economy. If that sounds like it contradicts my previous change of Joining the Republican Party, it doesn’t. Republicans believe firmly, if not openly, in Keynesian economics as displayed in its acts of granting special privileges and tax incentives for special interest companies. How better to drive growth in the private sector than to open up the trough of taxpayer money. There is nothing “Free Market” about the US’s current economy or market. The government dips its dirty little fingers into every aspect of commerce. If we need anything, it is less government. It doesn’t matter if it is Republicans or Democrats who run the government, the truth is that our hard earned tax money gets taken from us and given to special interests who did not earn it. That needs to end. I have decided to leave the Entertainment Consumer Association and instead join the Video Game Voter Network, run by the Entertainment Software Association. I have learned that consumer rights can never grow and blossom without the careful oversight of a benevolent and loving corporate parent. After all, corporations, especially multi-national and publicly traded corporations, know what is best for their consumers. That loving guidance is just not something that can come from an independent organization such as the ECA. The lack of autonomy of the VGVN was no clearer than it was during the protests of the Stop Online Piracy Act. In that protest, the ESA was busy trying to push the legislation through while the ECA was busy protesting and trying to put a stop to that infringement of our free speech rights. Silent throughout the whole protest was the VGVN. That proved once and for all that it would never be a source of real protection for video gamers. Interestingly enough, I did have one post that was not an April Fool’s joke. It was my first post of the day and was made prior to me remembering what today was. This was in regard to a picture a friend of mine posted that seriously misconstrued the arguments against a minimum wage hike. This is what I hate about the debate over minimum wage. 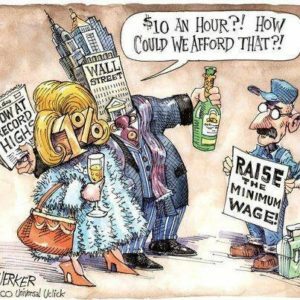 Those in support of increasing minimum wage try to make it out as CEOs of big multi-billion dollar corporations are against it. They are not. They actually love minimum wage increases because it causes competition to drop out. The people against minimum wage increases are those mom and pop shops that pro-labor people love to idolize. Those mom and pop shops are the ones actually hurt by increases in minimum wage. Those shops are already barely breaking even and adding unnecessary and costly increases to their expenses will hurt them more than anything. By supporting minimum wage, you support big multi-national corporations and hate locally owned mom and pop shops. So it has been an interesting day for me and anyone who follows me. I know I got my wife there for a while when it came to the switch to the Republican party. Many others were pretty quick on the draw and enjoyed the fun. We’ll have to see what I can think of next year. Why Should You Support the ECA’s Supreme Court Petition? Recently, the Supreme Court of the United States took up a case from California. This Case involves a law that was passed in 2005 that would regulate the sale of violent video games to minors. The video game industry, represented by the ESA, has challenged this law in federal court. Twice it has been ruled unconstitutional. It is now up to the Supreme Court to decide once and for all. The Entertainment Consumers Association has issued a petition that they want all people who play games to sign. This petition puts to voice of the people behind the defense of the game industry from this law. I have already put my name on it and I think you should as well.